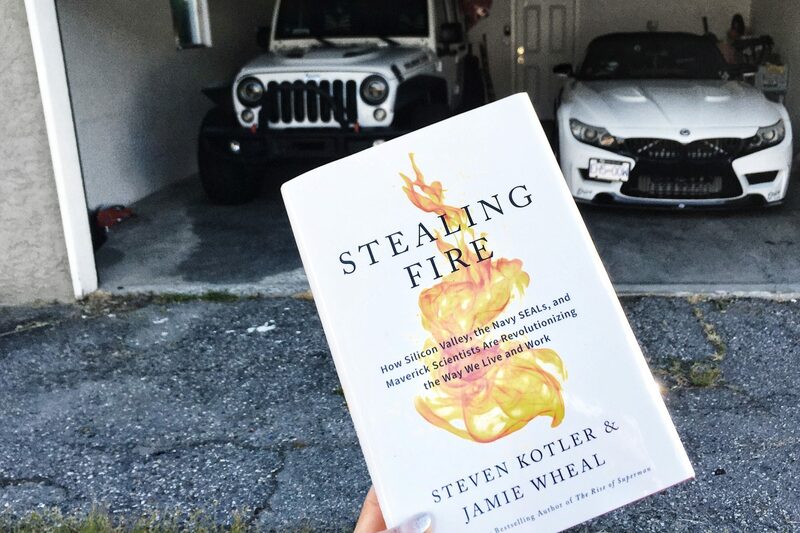 Stealing Fire – How Silicon Valley, the Navy SEALs, and Maverick Scientists Are Revolutionizing the Way We Live and Work. This book sits on a much higher place than what my worldview can reach to. The ideas are so advanced that not a single page doesn’t leave me awed. I couldn’t help but wonder the actual capacity within human race. “You can never read the label if you live your whole life inside the jar.” What we have been doing a lot to better our performance, things like grit, change habits, and practice 10,000 hours, are only expanding the jar. Yes, they do work, to certain extend. But we are still inside the jar. As I am writing this post on my favourite cafe window seat, countless people pass by on the other side of the glass. I’d take a guess, 99% of these folks probably have never thought of any the grand questions in this book. But what am I here to judge? I was just one of them. Begin with the brain release norepinephrine and dopamine to help tighten focus so we notice things we normally wouldn’t. Pattern recognition ability increase. Brainwave slows down from beta to alpha and put us into relaxed daydreaming mode. Then parts of prefrontal cortex shut down which bring us to “transient hypofrontality” – (temporary less than normal prefrontal cortex activity). This is the part of the brain that generate the sense of self. When it is off, our inner critics comes offline with it so we can experience a real sense of peace. Time is also processed in the prefrontal cortex. In non-ordinary state, prefrontal cortex turns off. The sense of time is not longer supporting the judgement of past, present, and future. We are stuck in the present moment which they call “The Deep Now”. 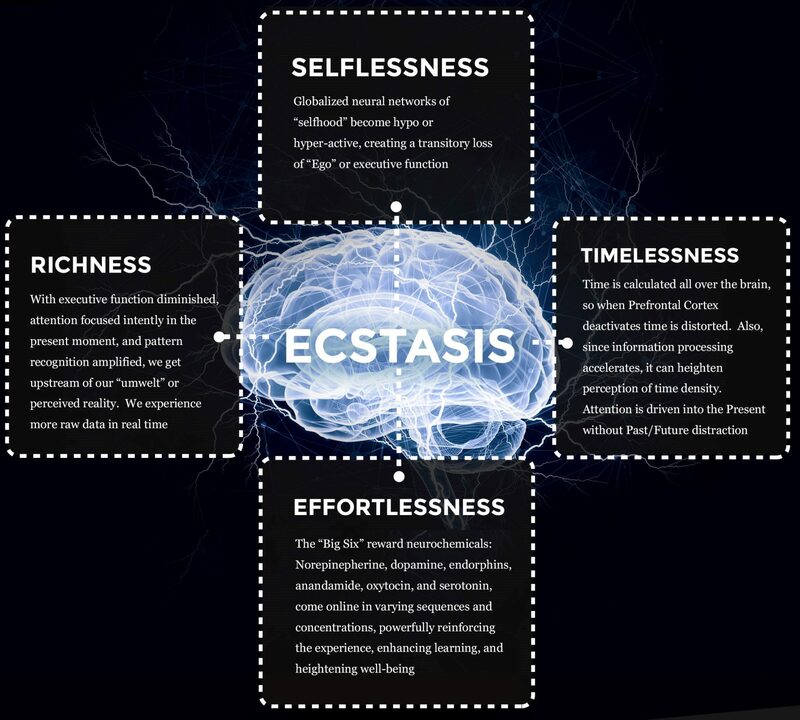 Moving deeper into ecstasis, the brain releases endorphins and anandamide. They decrease pain and distress. 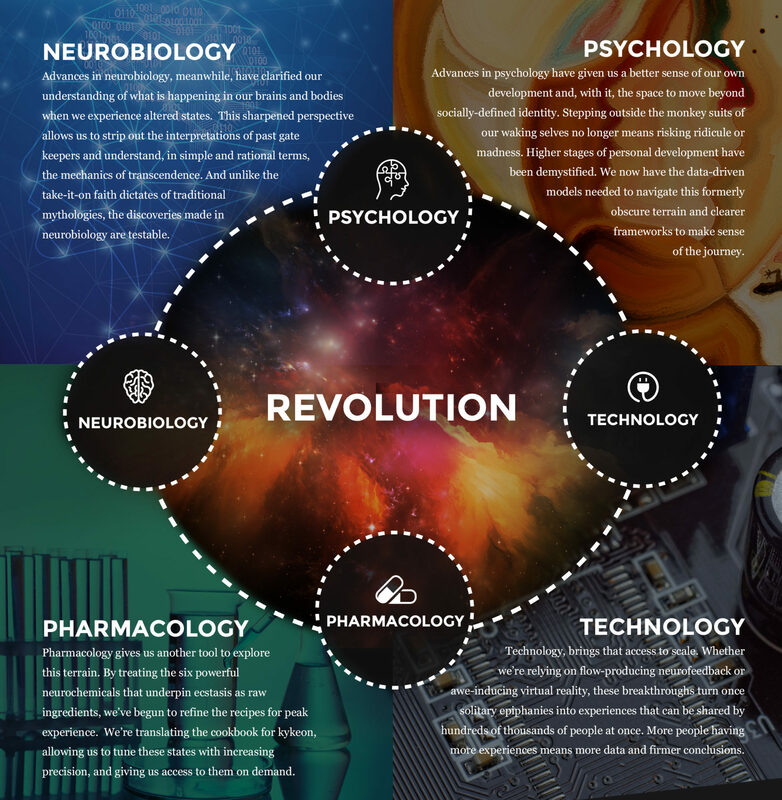 Anandamide promote “lateral thinking” that helps making connection among things very far away from each other – this is when a lot of successful inventions are created. As we go deeper, our brainwave shift again to quasi-hypnotic theta – usually only happen in REM sleep. And then the afterglow of serotonin and oxytocin which promotes feeling of peace and well-being. Together they create effortlessness, where you feel that you are able to do anything and you are happy doing it. Laws and regulations labeling with no clear explanation.